Home improvement supplies: At Mallow’s Hardware, you will find any type of hardware supply you might require for your home improvement project. 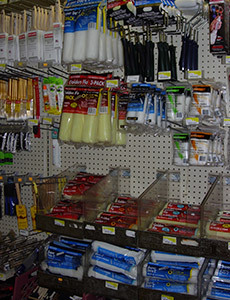 From hand tools to lumber to plumbing supplies in Altoona, PA, we carry it all. Stop in and speak to our knowledgeable sales representatives who can help you find whatever equipment, supplies or parts you might need. Whether you are performing home construction or need specialized hardware, we are confident we can help. Equipment rental: Often customers will have the need for a power tool or equipment, but don’t foresee continued use. No problem. At Mallow’s Hardware, you can rent a variety of equipment for any of your home improvement projects at an affordable rate. We rent carpet cleaning equipment, small tools and more. 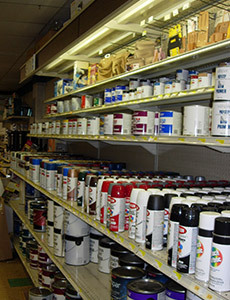 We have custom mixed Valspar paint, Cabot Stain, a full line of rustoleum, and the largest selection of quality spray paints! For the best in hardware sales and service, call Mallow’s Hardware at 814-944-1293 and find out why our customers have remained loyal to us for over 70 years.